North American insurers lead the way in IT spending globally and will invest $73 billion in tech areas such as data analytics, cloud, and insurtech in 2017. 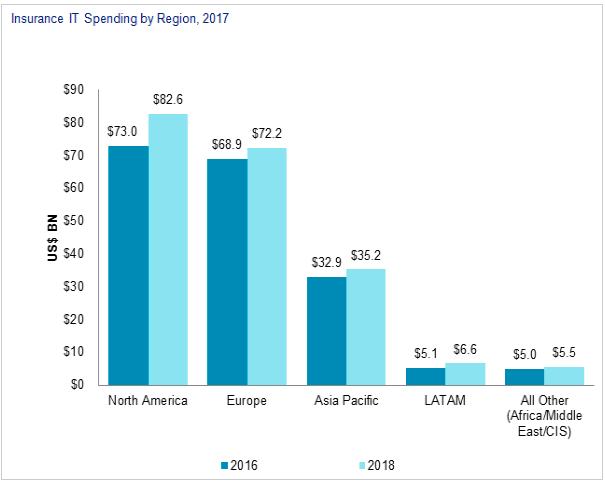 Digital Insurance reports that global IT spending by insurers is slated to reach $185 billion by the end of this year, according to the Celent “IT Spending in Insurance 2017” report. After North America, insurer technology spending by region is as follows: Europe ($69 billion); Asia ($33 billion); Latin America ($5 billion); then a group of territories comprising Africa, the Middle East and Eastern Europe (around $5 billion collectively). Three overarching trends – digitalization, data analytics, and legacy and ecosystem transformation – still dominate investment, Celent said. “In a few markets globally, we have seen a slight reduction in IT spending this year. Generally, the more mature markets remain under pressure to demonstrate value through efficiency,” said senior vice president Jamie Macgregor.